This entry was posted in aging, clothes, culture, elder wisdom, fun fashions, personal idiocies, shopping by Elaine. Bookmark the permalink. I keep my hair colored a very bright red. People stop me all the time and comment on how great it looks. I also wear purple glass frames. I do think these make a difference in how I am seen. I used to color my hair a red color. Now I refuse to color it, and it’s gray. Gray needs to be the new red, only I have to figure out how to embellish it without looking like I’m trying to be a teenager. Purple framed glasses. Hmm. I might copy that. It looks to me like many in our generation are in the mood for this freedom. Where my mother lives, there’s a woman who always has a balloon attached to her walker. Otherwise, it’s a pretty staid group – no one wants to stand out. I’m glad you and dkzody are willing to take it on and have some fun. 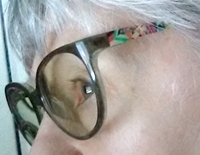 I still haven’t gotten beyond glasses with brown frames. Andrea, I suspect the balloon is so that she can identify her walker if she parks it and sits somewhere. When I was volunteering at an assisted living facility, I make brightly colored crocheted “walker bags” (each one a different color and pattern; lined with fabric and attached with velcro and straps) so that the women could easily find their walkers. Sold them for $20 each. When it comes to fashion, women are lucky. They have a variety of flamboyant and non flamboyant clothes to choose from and, as long as you are not too absurd in you fashion choices, you can get away with anything. Unfortunately, this is not so for men. When an elderly (I really hate that word) man decides to dress his age he has very little choice. He either dresses in a suit and tie that he has worn since his Bar Mitzvah, or he goes the other way and dresses in silly sportswear like team logo jerseys, baggy sweat pants or what they use to call “cruisewear”. Most old men wind up looking more like their 12 year old grandsons than the dignified older gentleman they are. I wish someone would publish a book or a pamphlet for us older guys. I’m tired of looking at my fellow seniors walking around in those stupid newsboy caps, pants with waists up to their chest and white patent leather belts. I recently switched to bright red lipstick for first time, and changed from conservative metal and brown framed eyeglasses to bright burgundy ones. My very funny winter hat and shocking pink spring raincoat are so distinctive that smiling people stop me on the street all the time to tell me they much they love them. Suddenly — not so invisible! Lots of good looks for men. My husband does a pretty good job of keeping in style. Many people at church compliment him on his fashion sense. I love the fashions that those older men are wearing — although, because I dress so casually, I still prefer men in sweaters and chinos. Even jeans if they fit well. My husband is almost always dressed better than me! Last night we went out to dinner and I wore my “work” outfit for the day–black slacks and the t-shirt for the organization for whom I volunteer with a pair of geometric print flats. Terry wore a white shirt, green tie, black trousers, and a herringbone black sports coat. I even mentioned, as we stepped into the restaurant, “you’re sure dressed a lot better than me,” to which he replied, “yes, I thought you might change your shirt before going out.” Never occurred to me!